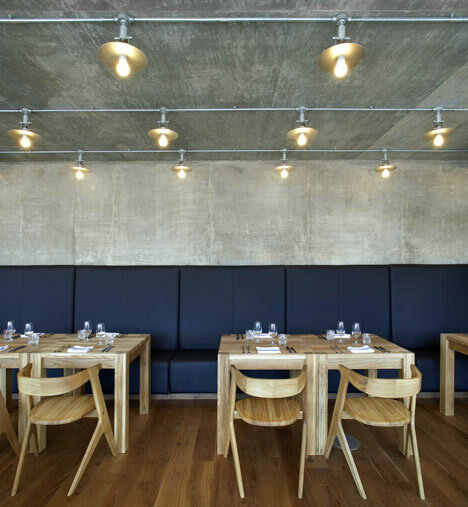 London studio Found Associates have completed this restaurant with an oak and concrete interior in west London. 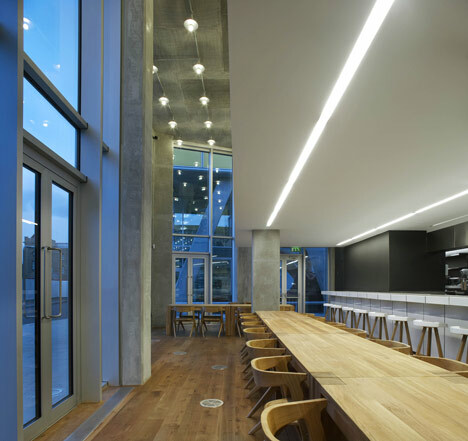 Called Nottingdale Cafe, the project involved adding a mezzanine level and creating a 10 meter-long bar clad in porcelain panels. Blackboard paint applied directly to the walls provides a surface for wine lists and specials. Found Associates were appointed to devise a new restaurant concept for the Nottingdale Village development in West London, opposite the Westfield Shopping Centre. 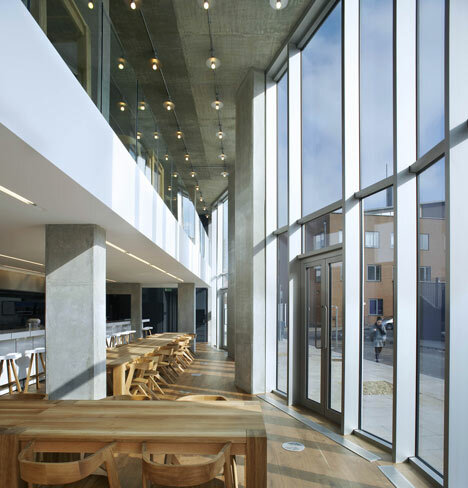 Following their successful implementation of TalkTalk’s new head office, the restaurant is the second building Found have been appointed to work on within this development (by award winning architects AHMM). The philosophy behind the restaurant is to serve the best ingredients in an unpretentious manner, while offering a relaxed but stimulating environment for the customer. 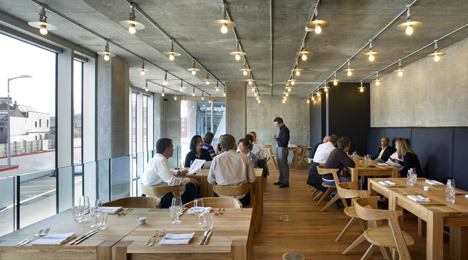 Although the restaurant offers food throughout the day there are two separate dining experiences; the lunch offer being an inexpensive frequently changing menu aimed at staff in the adjacent offices, whilst the dinner offer provides more refined a la carte menu aimed to set the establishment as an occasional venue. 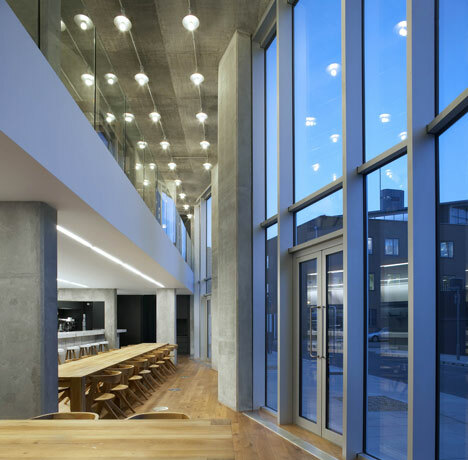 The existing building’s wedge shaped plan, multi facetted front elevation and pitched rear elevation presented a challenging space to provide a cohesive interior concept. 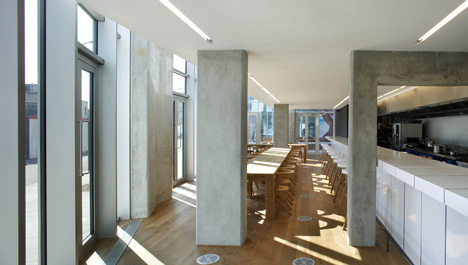 Found have reinterpreted the internal form of the building, adding a new cantilevered mezzanine with glazed balustrade, to create a dynamic series of linear single and double height spaces that rationalises the limited internal volume and reacts against the buildings angular plan form and external elevations. 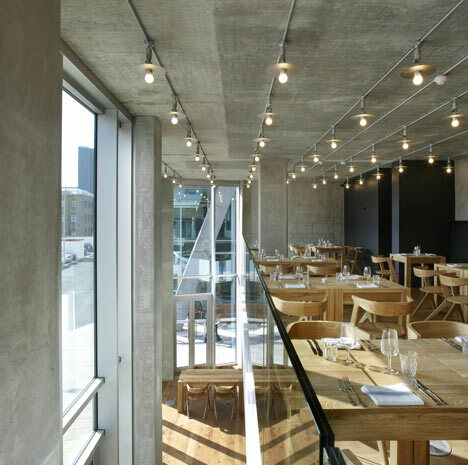 The dining area is spread over the ground floor and mezzanine, at the restaurants heart is a bespoke ten-metre long porcelain clad counter that runs almost the entire length of the ground floor. 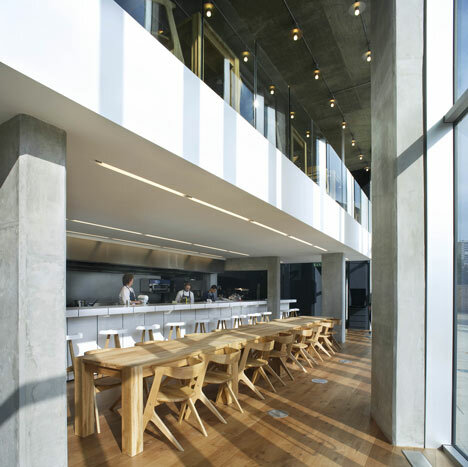 The counter is the focus of the ground floor dining experience, with diners seated on high stools while opposite them chefs prepare food in the open kitchen. Porcelain was selected for the counter not only for the unique quality of the finished material but also as a reference to the history of the site, which was for many years a centre for the Kensington Potteries. Each porcelain panel to the front, side and top of the counter has been created using bespoke moulds that have been formed, fired and glazed by a specialist supplier. 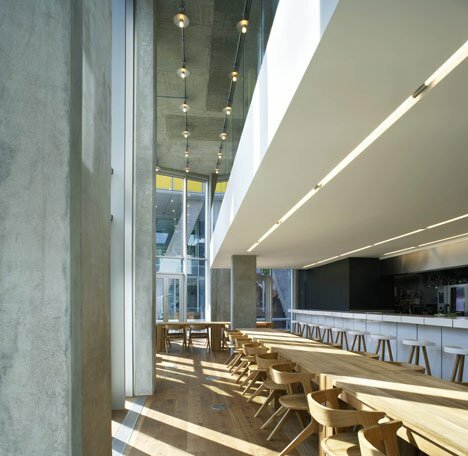 The fair faced concrete structure of the building provided a basis from which a complementary palette of materials were carefully selected. 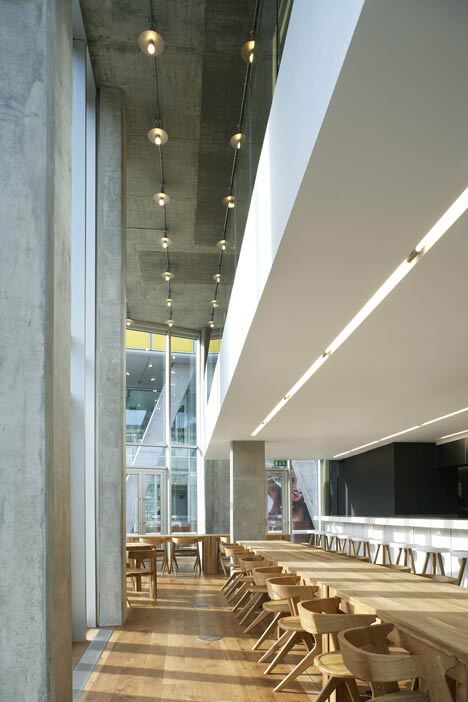 The aim was to retain as much of the existing structure as possible whilst offsetting the harder elements with natural materials. Much of the ground floor walls have received blackboard paint to enable the menu, specials and wine lists to be added/updated on a daily basis in multiple locations within the restaurant. 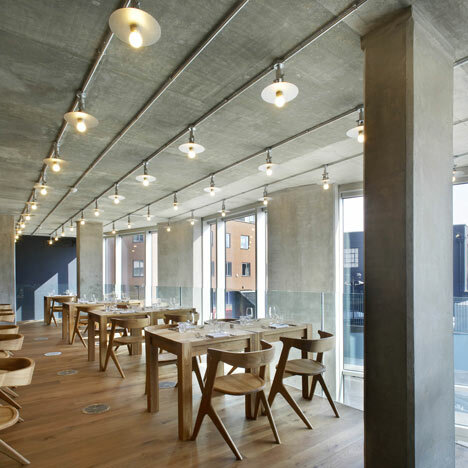 Solid oak with a natural finish was selected for the main floors and stairs to provide a warm contrast to the concrete and black walls. 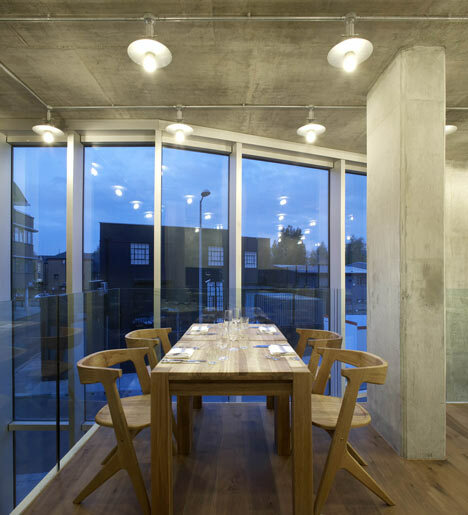 The chairs and tables are also solid oak and by specialist suppliers, the bar stools were ordered as soon as the design was brought out of prototype.